The following is an example of in situ thermal desorption and destruction (ISTD) of town-gas residues containing up to 61,000 ppm of polycyclic aromatic hydrocarbons (PAH) at a utility company waste site. The tar is the residue of town-gas manufacture over 70 years ago. Problems of the site include an average hydraulic conductivity of 74 md, areas of free tar, buried electrical debris, and a water table that is shallower than the contamination. 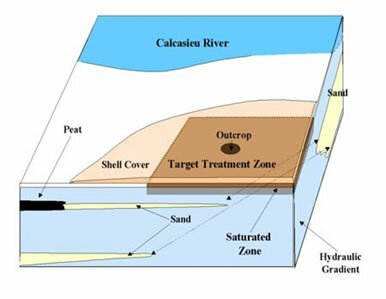 The following figure shows that the disposal site was in a marsh near a river. The waste is now 3-6 feet below the surface, with the water table at 2.5 feet. The treatment zone, centered around a tar outcrop, is 140’x 160’x 6’ deep. In the patented ISTD process, electrical heaters installed inside vertical wells heat the soil. The heaters are uniformly spaced, with a ring (or rings) of heater-only wells surrounding each heater-vacuum well. Heater temperatures reach 1500°F, and soil temperatures exceed 700oF. Contaminant capture is maintained since the boundaries of the TTZ are under vacuum. Most of the contaminants are destroyed in situ by pyrolysis and oxidation as they vaporize in the hot soil volumes near heaters. The remaining vapors are treated above ground. A major advantage of ISTD over other remediation processes is that it increases the permeability of the soil by 5 to 8 orders of magnitude as the soil desiccates. Thus, contaminants in silt and clay can be readily removed. Moreover, much of the heat is transported by conduction, so that impermeable barriers do not hinder the process. MKTS uses STARS to model all salient in-situ mechanisms. 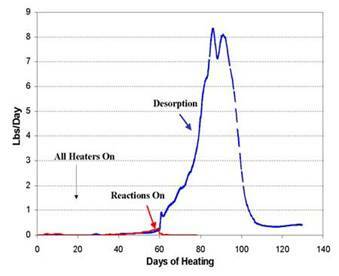 ISTD remediation time is determined by heater size and spacing, soil-water saturation and target temperature. The well spacing determines the heat that can be added, while the amount of water to be boiled governs the heat needed. Although larger well spacing slows remediation, ISTD is so fast that wider well spacing is favored, because the cost of constructing the site is reduced with the square of the well spacing. 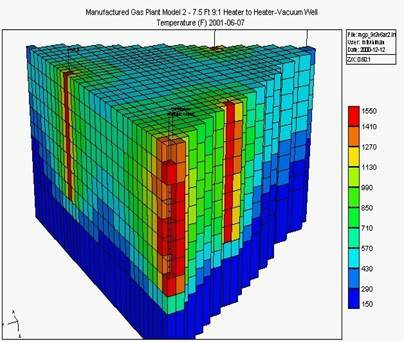 The figure above shows the temperature that will be achieved in the project after 80 days of heating. The figure shows the temperature in the 1/6th of an element of symmetry model is about 1500oF at heater wells but exceeds 1550oF at the heater-vacuum wells where the air and oxidizing reactions are concentrated. The temperature between heaters is nearly 1000oF, but the lower corners of the model are just hot enough for the larger PAH compounds like benzo(a)pyrene [B(a)P] to be desorbed by the end of the heating cycle. There are four major classes of destruction reactions. These are oxidation, pyrolysis (coking), water-gas reactions, and reactions of coke with water or air. The reactions in ISTD are analogous to those that take place during in situ combustion or pyrolysis of petroleum. Combustion does not actually occur in ISTD because the concentration of fuel is not high where the flux of air is significant, e.g., at the heater-vacuum well. Most decomposition takes place throughout the heated soil matrix and in the very hot vapors. Other reactions that occur are similar to pyrolysis, coking and steam reforming reactions, which are used in chemical plants and refineries to form olefins, coke and carbon oxides. The steam reforming reactions that form carbon oxides are the same reactions used to make town gas at the site. 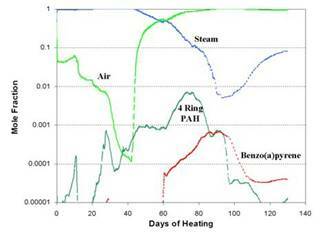 This figure compares the mole fractions of steam, air and contaminants that are predicted to be produced. Initially there is little oxygen (air) available unless it is being injected at the heater-vacuum well because all of the original oxygen is consumed by the contaminants in the soil matrix. Moreover, water is being removed from the site. This steam bank prevents air infiltration into the site. Thus, reactions with water and coking will be the primary destruction mechanism for the first six weeks. Then oxidation of PAH and coke can become more important. We used 18 simultaneous reactions to predict that 99.999% of the carcinogenic PAH benzo(a)pyrene production, as seen in the final figure, will be consumed after 60 days of heating. The simulations show that coking and oxidation with air are primarily responsible for the destruction. PAH oxidation should provide about 25% of the energy needed to desorb and destroy the hydrocarbons. Simulations like these are invaluable in engineering ISTD projects. Not only do they assist in selection of the spacing and design of the wells, but they also show how the wells should be operated, how long the process can take, the energy required and how best to destroy the PAHs. For more information on ISTD please visit TerraTherm’s website TerraTherm.com or contact MK Tech Solutions.